This poem is about the longing to escape physical and emotional suffering. Keats expresses deep anguish which appears to be a combination of bodily pain accompanied by thoughts and memories which torment him. As he lies awake in bed, he longs for the forgetfulness of sleep, but sleep eludes him. Sleep is a common metaphor for death, and Keats uses certain words associated with death to convey the sense that he is weary of living and longs to pass from mortal existence. The words “embalmer” in the opening line and “casket” in the closing line actually serve as a way of entombing the entire poem. Also, the fact that the poem is set at midnight implies that he is at a symbolic threshold, ready to move on to the next plane of existence. There is one last thing I feel is worth noting. In lines 7 and 8, there is a reference to the use of poppy, which in Keats’ time would be opium. It appears that Keats has turned to narcotics as a way to ease his physical and spiritual pain. But in spite of his self-anesthetizing, he is still unable to numb the darkness, “burrowing like the mole” into the deepest regions of his psyche. This issue concludes the “Last Days of Magic” arc, and just like the previous installments, the artwork, story, and symbolism is supreme. I want to focus this post on pain and how the way we choose to deal with pain affects our physical and mental health. Within this tale, it comes to light that Doctor Strange has been hiding away his suffering, the result is the creation of a monster which is the physical manifestation of his repressed pain. I found this to be an accurate representation of what happens when an individual locks away personal anguish and trauma. That pain grows and festers within the individual until it becomes an internal monster, gnawing away at a person’s physical and mental well-being. For this reason, it is important to share your pain, because pain shared is pain lessened. And this is what finally happens to Doctor Strange. People who the Doctor helped in the past now make themselves open to sharing and taking on a part of the Doctor’s suffering. When this happens, the monster which Strange created by hiding away his pain begins to weaken and lose its power. Monster: I can feel them… sharing your suffering. All over the world. All of their own accord. How… how do you inspire such devotion? When I was growing up, it was common for people to hide their feelings. To show emotion was to show weakness. Thankfully, more and more people these days recognize the importance of sharing your pain with others. It is very therapeutic and leads one to live a more happy and serene life. It’s difficult to believe that I have only now gotten around to reading this masterpiece. I’ve seen it performed on stage, seen the film, and actually met Gregory Peck at a dinner reception and discussed the writer’s role in filmmaking with him, but it was my daughter wanting to read this book with me, kind of as a father/daughter mini book club, that finally motivated me to buy a copy. This book is so rich that it would be easy to write multiple blog posts exploring the many facets. You could obviously approach it from its frank addressing of racism, as an exploration of Southern culture, or as a coming-of-age tale. For my post, I’ve decided to pick one symbol and explore it a little deeper: the house. In this book, Ms. Lee uses the symbol of the house to represent one’s psyche. As with every person, there are two parts to the psyche: the one which we show to others and the one that is hidden away. To understand how this symbol applies to this story, keep in mind that the inside of a home represents a person’s inner thoughts and feelings, while the outside of the home signifies that part of someone which that person decides to make public and known. For example, in the book, no one knows exactly what happens within the Radley house. We know that Boo suffers from mental illness, so the inside of the house becomes a symbol for the thoughts of someone who is mentally sick. Disturbing a person within their home implies that you are attempting to pry into that person’s private thoughts. When the children are spying on the Radley house and trying to see inside, they are essentially trying to sneak a peek into someone’s psyche and discover the secrets buried deep within that person’s mind. Another great example of the inside of a house symbolizing the inner aspects of a person’s psyche is the inside of Mrs. Dubose’s house. Mrs. Dubose suffered from morphine addiction and the inside of her home reflects the inner turmoil and pain associated with drug addiction. Jem and Scout, being allowed entrance into Mrs. Dubose’s house to read Ivanhoe to her as punishment, are exposed to the shadowy realm of her consciousness, where she is haunted by the darkness of her addiction. At one point in the story, Scout wants to invite Walter Cunningham over to the house for dinner. Aunt Alexandra tells her that she should not do so, that it is OK to be nice to someone, but that does not mean that you should invite that person into your home. Essentially, she is advising Scout to be careful regarding who she allows to know the deeper parts of her thoughts and feelings. There are many other great examples of how houses reflect the psyche’s of those who live there, and if you read this book again, I encourage you to think about how houses symbolize the minds of those who inhabit them. 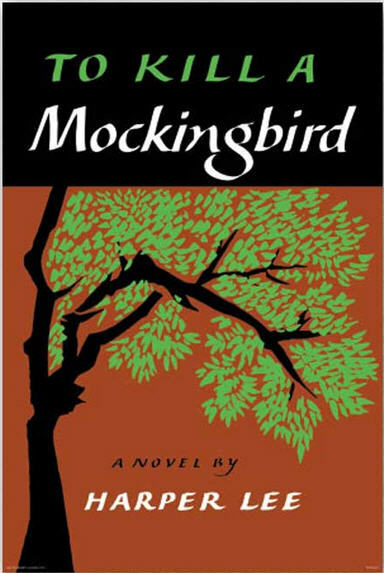 On a closing note, I’m sure many of you have heard that Harper Lee is getting ready to publish the “sequel” to To Kill a Mockingbird later this year. I for one am looking forward to it and plan to read it once it comes out. Thanks for stopping by and I hope you have a wonderful and inspiring day! !